On Apollo 14, Alan Shepard famously hit the first golf ball on the Moon. Because of the stiff space suit, he had to hit one-handed. After several tries, he sent it off camera and claimed it went “Miles and miles and miles.” But did it really go that far? Does the Apollo 14 lander seem closer than 650 feet (two football fields) or taller than 10’7”? 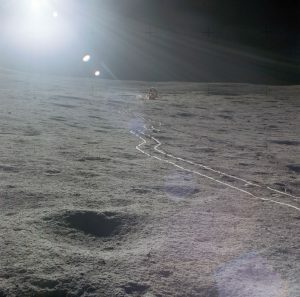 The near horizon, sharp shadows, and a tendency to underestimate distance and overestimate height of objects makes judging distances difficult on the Moon. On the surface of the Moon, many of the cues used to judge distance, such as trees and trucks, are missing. The lack of air also makes objects appear sharper and thus closer—adding to the tendency to underestimate distance and size of objects. Finally, the Moon is a smaller world than Earth, so the horizon is much closer. From a height of about six feet, the horizon is about 1.5 miles away (compared to about 2.8 miles on Earth). Combining all these effects means that what first appears to be a small nearby rock is actually a distant boulder. So did Shepard’s ball go miles and miles and miles? [Watch video.] The record for a golf drive (Mike Austin, 1974) on Earth is 515 yards/0.3 miles. Some people have speculated that because of the Moon’s low gravity and lack of air, a golf ball hit that hard might sail more than two miles. Considering Shepard was likely underestimating the distance by up to a third, I wouldn’t be surprised if the ball went a mile—but not more than 1.5 miles since it didn’t disappear over the horizon. More studies on how people judge distances and react in space will help us better understand our ingrained biases when it comes to judging distances in space. Laser range finders and future AI lunar golf advisers may even help us figure out how much of a handicap to give an astronaut in a stiff space suit! I’m thrilled to announce my newest space book! 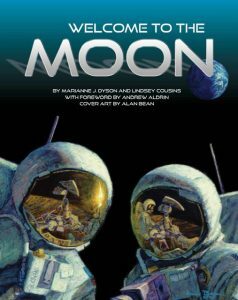 Watch my website Book Orders page for Welcome to the Moon ordering information. My fact article about a practice drill for what to do if an asteroid threatens Earth, In Defense of the Planet, is a finalist in the AnLab Readers’ poll. It is available FREE on the Analog website until the winners are announced at the Nebula Awards in May. 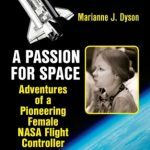 I offer programs appropriate for school-aged children up through senior citizens, as well as science workshops for students and teachers. See my list of programs on the Author Visits tab of my website. Saturday, May 11, Comicpalooza, GRB convention center, Houston. I’m on two panels in the Literary Track (upstairs rooms). From 3-4 PM, Worldbuilding Tips and Tricks: How to Create Believable Worlds, and from 6-7 PM, Writing Historical Fantasy—Getting the Details Right! Thursday, May 23, Bay Area Writers League, Clear Lake Park, Houston, 7 pm. “Beyond Self-Publishing: Becoming a Publisher. What are the financial, legal, personnel, quality, quantity, and time considerations of creating books for companies or individuals? Friday May 31, WriteFest Weekend Festival, Anderson-Clarke Center (6100 S. Main St. Houston, 77005), Rice University. The weekend festival includes panels, presentations, agent pitch sessions, and a book fair. Look for me on panels and at the book fair. Register early for the best price ($95 to $185 one day only & $180-$375 F-Sun). See my website’s contact page for a complete appearance schedule.